Barnsley ended a run of eight straight defeats in League One with a narrow victory at Oldham Athletic, which eased the pressure on manager Lee Johnson. Adam Hammill hit the post for the visitors, before Conor Hourihane fired Barnsley ahead from 20 yards. Oldham improved after the break and drew level when Mark Yeates fired home after collecting Dominic Poleon's pass. But on-loan defender Kevin Long's powered in from close range to seal a crucial three points for the Tykes. "Bitter cold day, bitter result, disappointing to come off the back of two wins. "Poor first half performance, probably as bad as we've played to be honest. "We started the second half really well and got ourselves back in the game with a goal." Match ends, Oldham Athletic 1, Barnsley 2. 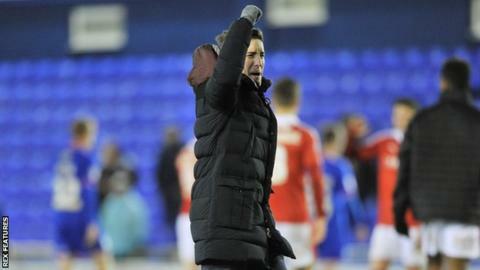 Second Half ends, Oldham Athletic 1, Barnsley 2. Foul by Cameron Dummigan (Oldham Athletic). Attempt saved. Mark Yeates (Oldham Athletic) right footed shot from a difficult angle on the left is saved in the bottom left corner. Attempt saved. Dominic Poleon (Oldham Athletic) right footed shot from outside the box is saved in the top left corner. Goal! Oldham Athletic 1, Barnsley 2. Kevin Long (Barnsley) right footed shot from the centre of the box to the top left corner. Mark Yeates (Oldham Athletic) is shown the yellow card for a bad foul. Foul by Conor Hourihane (Barnsley). Substitution, Barnsley. Simeon Jackson replaces Ivan Toney. Attempt missed. Cameron Dummigan (Oldham Athletic) right footed shot from outside the box is close, but misses to the left. Corner, Barnsley. Conceded by Cameron Dummigan. Goal! Oldham Athletic 1, Barnsley 1. Mark Yeates (Oldham Athletic) right footed shot from the centre of the box to the centre of the goal. Assisted by Dominic Poleon. Attempt missed. Ivan Toney (Barnsley) right footed shot from the centre of the box is close, but misses to the right. Foul by Ivan Toney (Barnsley). Substitution, Barnsley. George Smith replaces Aidan White. Jay Fulton (Oldham Athletic) wins a free kick on the left wing. Foul by Marley Watkins (Barnsley). Ben Pearson (Barnsley) is shown the yellow card for a bad foul. Foul by Ben Pearson (Barnsley). Substitution, Barnsley. Sam Winnall replaces Lloyd Isgrove. Attempt missed. Adam Hammill (Barnsley) right footed shot from outside the box is close, but misses the top right corner. Substitution, Oldham Athletic. Michael Higdon replaces Giorgio Rasulo. Hand ball by Adam Hammill (Barnsley). Ivan Toney (Barnsley) hits the bar with a header from the centre of the box. Foul by Aidan White (Barnsley). Hand ball by Giorgio Rasulo (Oldham Athletic). Cameron Dummigan (Oldham Athletic) wins a free kick on the left wing. Corner, Oldham Athletic. Conceded by Aidan White. Foul by Jay Fulton (Oldham Athletic).